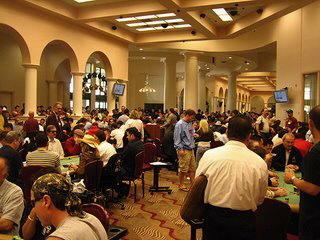 The Bay 101 Poker Room is one of the most upscale poker arenas that can be found in the San Jose, California area. Greeting players on arrival is an elaborate fountain with dolphins frolicking through the waters. Once inside players instantly feel as if their old lives have been left at the door and traded in for a more luxurious style of life. Every whim, every desire, every want is catered to by an elaborately trained staff. The Bay 101 casino enjoys a convenient location of a three minute drive from the Norman Mineta San Jose International Airport. It can be found tucked away between US Highway 101 and Highway 880. Hours of operation are 24 hours a day 7 days a week for the 72,000 square foot facility. This is plenty of time for even the most avid poker player to squeeze some time into a day to play the game. An ideal schedule would include a couple hands of poker in between leaving the office and driving home for dinner. Players are treated to a host of activities that expand beyond the poker playing table. For example, there is a full scale salon available. Bay 101 offers their players two different gaming floors featuring various poker games. This allows virtually every player the opportunity to find that favorite game or perfect skills learned on a new game. Starting with the Poker Room floor there are four main games being played at any one time. These are 7 card stud; Texas hold ‘em; Omaha and Pan Games. Betting limits for these games are fairly straightforward. 7 card stud is a single table game with limits of $4 /$8 . Omaha poker games may also be found on this floor. The limits at these two tables are $4 /$8 and $10 /$20. The popular game on the floor is none other than Texas hold ‘em. It is this game that gives the casino its notable status with the world poker tour federation. During peak hours of play, there are eight different tables of Limit hold ‘em being played. Limits are $2/$4; $3/$6 $9/$12; $12/$24; $20/$40; $40/$80 and a big game of $80/$160. Hold ‘em games with betting limitations of 8/16 and higher create the high-limits area of the casino. There is also a variant of no limit games with blind structures of 2-2-5 and 5-5-10 which get tons of action. The three blind structure is a way to go around the poker legislation in california. On the California floor of games there are two games of century blackjack available for different betting limits. There is one table with a $10 /$100 limit and another table with $40/$10 limits. Next there are three different tables of double hand poker being played at any given time. The limits for these tables are as follows: $10/$100; $40/$100 and a $100/$200 limitations. The final two gaming tables that can be found on the California floor is Pai Gow with a $10/$100 limit and Pan 9 with a $10/ $100 bet limitations. 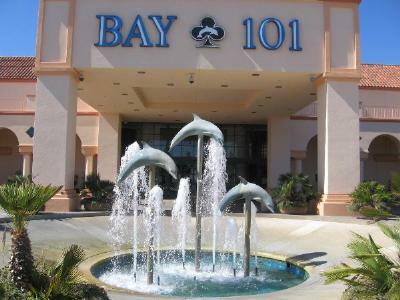 The Bay 101 casino provides a house dealer for each game played. California poker gaming regulations must limit the betting amount to $200 or 3 raises per gaming table. There is also the regulation placed on No Limit Hold ‘Em (NLHE) betting limits as mentioned previously. Outside of these two minor regulations, gaming tables are open and ready for play with no limitations in place. Players are assessed a small service charge based on the game being played and the number of players involved in the hand. For the games on the California floor, there is a player position collection fee based on the amount of the betting wager. Betting amounts within the $10 to $100 range are assessed a $1.00 player position/wager fee. Player/Banker position collection fees start at $2.00 and increase to $5.00 for the 1st player position. For the 2nd position or later, the fees start at $1.00 and increase to $5.00. The amount charged is based on the wager being placed. Over on the Poker Room floor the player service charge assessment is figured a little differently. At any given gaming table with 5 or fewer players, each player is charged a $1.00 service fee. For 6 players the service fee is $3.00 and for 7 or more players the fees range from $3.00 to $5.00 depending again on the amount of the wager for a given hand. It is possible for players to call the casino in advance of arrival to reserve a seat at a particular table of interest. This is a popular feature for games in the high limit rooms of the casino. A variety of tournaments are held on a daily basis throughout the week. 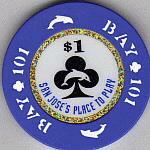 Bay 101 hosts some of the Bay Area’s best texas holdem tournaments. Tournament play kicks off with a 9:00 am $80 limit Texas hold ‘em tournament with a $60 re-buy option. Monday features two different spread limit hold ‘Em tournaments with a $120 spread limit. There is a midnight tournament held at 1:45 am and a Turbo tournament held at 9:30 am. Two tournaments are also held on Tuesday. One is at 1:45 am for a $120 spread limit hold ‘em game and a $60 spread limit game with a 20 re-buy option at 9:30 am. The remainder of the week contains various denomination spread limit Texas hold ‘em games. Each game takes place at 9:30 am with Saturday’s game being held at 8:15 am. Participants in these weekly tournaments earn points that make them eligible to qualify for a seat in one of two big poker tournament events held at the casino each year. It is advisable for anyone wishing to enter a daily tournament to show up for registration at least 30 minute prior to the start of the game. There is a limit of 120 players for each tournament game played. With some many players in the pool it is easy to see how the prize pot can quickly grow in a matter of minute. Average prizes awarded to the winner of a weekend game have ranged in the $10,000 area. Each year the casino holds the World Poker Tour Shooting Stars Tournament. Here regular every day players face off against seasoned poker professionals that are called “bounty players”. Each tournament gaming table features one bounty player and regular players. If you knock out a name player you automatically receive a $5,000 bonus. In addition to winning this tournament where the top prize typically tops 1 million dollars; the player receives entry into the upcoming world poker tour championship tournament. There is also the Bay 101 open poker tournament. This can be entered via registration or via earning points in the regular weekly poker tournaments the casino holds. Over the course of ten days, there are several different tournaments such as spread limit hold ‘em and Omaha 8 or better. The winner of this tournament receives $10,000 and a seat in the upcoming world poker tour/shooting star event. The Bay 101 open is one of the major attractions of the casino. It is also very convenient that Bay 101 hosts the world poker tournament satellite competitions righ here in the Bay area. This occurs over the summer months of May and June on Saturday. The featured gamed is a spread Texas hold ‘em. Registration is one day in advance or the morning of the tournament. Entrance fees are $105 plus additional $20 buy-in fee. For this amount, the player receives $1,000 in chips to play with during the game. At the point a player runs out of money, there is the option to purchase an additional $1,000 in chips by paying a $100 re-buy fee. The game consists of 17 rounds of play. Each round of play extends for a 20 minute duration period. A player progresses by moving forward to each round until chips run out and re-buy is no longer an option. At the end of play, a winner is determined. That person wins a cash prize plus entry in that year’s world poker tour tournament main event. Bay 101 dealers are among the most experienced and friendliest in the poker industry. These individuals are willing to give a new player some time to learn the ropes of a given game. Each gaming table features a standard shuffling machine by Shufflemaster to handle card decks. Generally there is no wait time for play at any of the gaming tables. On the weekend this can change as Friday and Saturday sees wait times of one hour or more for the more popular table games. Players are kept comfortable with high ceiling fans placed in the vaulted ceilings of the casino. This adds to the upscale atmosphere of the casino as well. Other upscale features include the marble laden front entrance point and large sized brass and glass doors opening into the gaming areas. The walls are blanketed with well placed LCD televisions that keep players up-to-date on what is going on outside casino walls. During major world poker tour tournaments, television screens display tournament time clocks and other related details. When hunger pains strike, there is a 24 hour sports bar on location showcasing a full scale restaurant menu. For a quick snack, the in-house deli is the perfect stop. There are a variety of snacking items to select from including ice cream, sandwich or refreshing beverage. For those that do not wish to leave a gaming table for a quick bite, a table on wheels comes to them. This allows a player to fill the hunger void without missing out on the gaming table action. Safety of guests is the top priority of staff at Bay 101 casino. A skilled security team provides escorts to personal vehicles upon request. This can make a patron feel at ease in the situation where a large size jackpot amount was won at the poker tables. Parking lots are well light and easily navigated at any hour of the day. Bay 101 is home to some of the major world poker tour tournament events. As such, notable players in the poker arena do make appearances on a regular basis outside of the tournament setting. On any given day it is possible to catch a glimpse of famed poker players such as Freddy Deeb, Daniel Negreanu, Tom McEnvoy and Scotty Ngyuen. These individuals are regular “bounty” players for the world poker tour tournament “Shooting Stars” event that is held at the casino each year. Overall The Bay Area Bay 101 Poker Room is a great place to play a few hands of poker among people who start out as strangers but quickly become friends by the end of the game. Come out and see why the casino has earned the reputation of being San Jose’s number one stop for poker. The Bay 101 Poker Room Casino got its start back in 1929. Then it was known as the Sutter’s Club which derived its name from owner Joseph Sutter, Sr. The original location at that time was at the intersection of Old Aviso Road and Highway 237 in Alviso, California. Entertainment was the main course of the day at that time. There were no poker tables or other gaming features present in the club. It was not until Sutter, Sr’s death in 1947 that those items were introduced to the facilities. Joseph Sutter, Jr. took over day-to-day operations of the Sutter’s Club and added five poker tables to the environmental mix. As time progressed, Highway 237 underwent a widening project. This forced the casino to look for a new home. In September of 1994, the facility re-opened in the bay area under the name of Bay 101. Raving reviews were quickly flooding in the door as were eager participants ready to take a stab at one of the 40 various gaming tables found throughout the facility. Bay 101 has earned the distinct honor of being named the premier gaming facility on the west coast of the country. This entry was posted on Sunday, May 11th, 2008 at 4:49 am	and is filed under bay 101 review. You can follow any responses to this entry through the RSS 2.0 feed. You can leave a response, or trackback from your own site. Thanks. We will add some more casino reviews in the coming weeks. I’m still not quite understanding the fees charged to players at the poker table. Is it a rake or do you have to pay every dealer change? Can you explain this a little better. Thanks in advance.